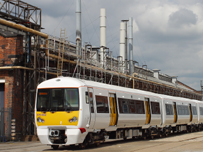 Transport for London has taken the lead in ordering 152 Electrostar electric multiple unit cars to work the East London line and north London line from Bombardier in Derby. The contract value is approximately £223 million and includes vehicle manufacture and the first 7.5 years of servicing. Delivery starts July 2008, with the last unit scheduled to be delivered in May 2009. Included within the contract are options for the manufacture of 196 additional cars. The 100mph Class 376 units are specially designed for suburban operations. Electrostars are used by c2c, Southeastern and Southern. The new vehicles will be manufactured at Bombardier’s production site at Derby and the servicing will be primarily delivered at a new purpose-built traction maintenance depot at New Cross Gate in East London. Says Colin Walton, Chief Country Representative UK, ‘This order will help secure employment for our highly specialised workforce at Derby.’ Bombardier Transportation employs over 4,000 people at production facilities in Derby and Plymouth and 24 maintenance, refurbishment and overhaul centres across the UK. The company maintains approximately 2500 vehicles.